The history of Union Township reveals a truly remarkable pro­gress onward and upward, with setbacks of course from time to time, but never any serious inter­ruption of the advance. The trend across all the span of one hundred years has been a happy one. Beginning with the valiant efforts of hardy, God-fearing pioneer stock, the foundations were laid upon which a strong and age-en­during superstructure has been reared. So secure has been this construction that, no matter how severely the storms of time have battered it, nor how ravaging have been the lean years, taking their miserable toll here in a peaceful countryside just as in the uttermost corners of the earth, this edifice of community life and spirit has remained. unshaken, sound, and whole. Those of today have much for which to be grateful. Their thanks must surely go to the sturdy and enduring ones who have preceded them in the hundred years since the coming of the first white set­tlers to this region. Theirs shall be an honest pride in a noble heritage. The written history of Union Township can never be complete, neither can that of any other re­gion. The writer of these few hum­ble chapters feels that he has merely "scratched the surface," and much finer things, the richest nuggets, remain hidden there, deeper down than his feeble ef­forts possibly could reach. Un­avoidable circumstances termin­ated the research, leaving the writer in possession of a fund of material an many subjects, sever­al of which have not been touched upon in the published chapters. But this material, despite its bulk, is insufficient, in the writer's opin­ion, to do full justice to the sub­jects concerned. It is too fragmen­tary, There are too many gaps to be filled--mostly skeleton and not a great deal of meat to cover the bones. So, the writer prefers to leave unwritten and unpublish­ed, far the present, these other chapters, in the hope and expecta­tion that the day will come that will enable him to complete the uncompleted units, though the whole be impossible of comple­tion. Among those themes, each of which could have filled a chap­ter, planned for incorporation in this history, might be mentioned these few: Pioneer Log Cabins; Mills, Grist, Saw, and Cane; Schools and Schooling; Sports and Sporting; Organizations; Culver Military Academy; High­ways and Byways; Railways; Tel­egraph and Telephone; Post and Post Office; Tragic Events; Early Methods; Hunting and Fishing; Temperance; Boats and Boating; Inns and their Hosts; More Memories; and Further Recollections. These subjects may some day be included in a separate and no doubt smaller volume of "One Township's Yesterdays." Mrs. Ada B. Butler, "Neighbor". J. F. Cromley, Harold Robinson, W. S. Easterday, W. T. Parish, W. O. Osborn, M. R. Robinson, Carl M, Adams, John Osborn, Deane E. Walker, Miss Edna Stahl, Ralph Houghton, D. H. Smith, Rev. Rich­ard Pengilly, George Nearpass Jr., Ralph Thornburg, N. W. Rector, Charles E. Hayes, W. C. Routh, G. W. Green, Clarence D. Behmer, Mrs. Gertrude A. Behmer, S. C. Shilling, L. C. Wiseman, Arthur Simpson, John C. Butler, Clark I. Ferrier, George M. Spangler, Rev. Harvey E. Harsh, Melvin J. Os­born, Mrs. Jennie A. Mattix, J. E. Young, Otto Stabenow, Arthur Morris, J. W. Riggens, Elza H. Hawkins, Colonel Ellsworth Wells, Mrs. Rebecca Robinson, Mrs. Augusta Warner, M. T. Lou­den, H. M. Speyer, the late A. A. Keen, Dan Marks, Rev. J. H. Rill­ing, Ezra Hibray, Ezra Hawkins, Frank Brooke, Lester Young, Mrs. Mabel White, Harvey Warner, Ed Hawk, Forrest Geiselman, Bill Farrell, P. A. Wickizer, the late Mrs. Marion Augusta Swigart, Al­bert F. Stahl, Miss Eve York, Tim Wolfe, Claude Newman, Lewis Zechiel, and Henry Zechiel. 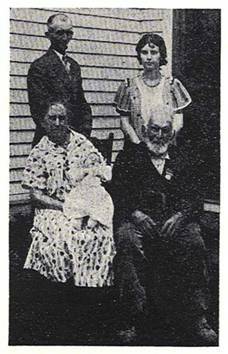 A PICTURE OF YESTERDAY Five generations in the Spang­ler and Babcock families, ranging from 90 years to six weeks, are pictured here when a get-together was held several years ago. The ages are as of the time the picture was taken. Sitting are Peter Spangler, age 90, a Civil War veteran, formerly of Culver and Rochester; his daughter, Mrs. Laura E. Babcock, of Rochester, age 68, who is hold­ing Patsy Gail Henderson, age six weeks, of Culver. Standing are R. L. Babcock, age 50, and his daugh­ter, Mrs. Gail Henderson, age 23, both of Culver.